YODER “MOST RECENT COMMON ANCESTOR”!! The Y DNA profile which is pictured above is the “37 marker” profile which belonging to the “Most Recent Common Ancestor” of the US Yoders. The Yoder DNA Project began in January and testing of over 40 Yoders has established that this profile also belonged to Caspar Joder of Steffisburg, Switzerland who was born in 1571 and married in 1596 to Margret-Hennig. ANCIENT YODERS COME FROM VIKINGS & MAKERS OF “VENUS FIGURES”: In human genetics, a “haplogroup” is an ancient grouping or tribe of mankind. The DNA tests show that descendants of the Swiss Joder family have a profile with a “computed” haplogroup of “I”. “According to current theories, haplogroup I first arrived in Europe around 20,000-25,000 years ago from the Middle East. It can be found in most European populations, most commonly in Scandinavia and Croatia. Its initial spread is believed to be connected to migrations of people during the last glacial maximum.” One of our test members has had the detailed haplogroup testing done, and it reveals that our actual haplogroup value is “I1c”. PROFILES IDENTIFIED FOR MAJOR YODER IMMIGRANTS: By sampling two or more sons of each immigrant line, we have been able to identify the Y DNA profile for the immigrant himself. They all match exactly at 25 markers! (except for the first Yorty sample). UNIQUE MARKER FOR EARLY AMISH IMMIGRANTS: For the 1742 Amish Yoders, we see that there is a unique pre-immigrant mutation at Marker 19- a value of “16” instead of the “15” shared by the other matching Yoders. This applies both within the children of YR2 Christian Yoder (c1700-1775) as well as those of YR1- (name not known) who "died at sea” and left a “Widow Barbara" as head of the family. The other 18th century unlinked Amish man Yost Yoder (YRB) also shares this mutation - implying that he was descended from a common ancestor as YR1 and YR2. C.Z. Yoder wrote in his 1932 book that when Yost’s son Christian married Magdalena Yoder (YR252) (granddaughter of YR2) “tradition has it that she was not related to Christian.” Results also show that YR25 descendants have a unique mutation at marker 389-2. PROFILES FOR MEMBERS OF CASPAR JODER FAMILY RULE OUT SOME AS AMISH PARENTS: The speculated ancestry for the Amish Yoder line was discussed in an article by Rachel Kreider in YNL 11 and 12. We have at least one living male descendant tested in the families of five grandsons of Caspar Joder and Margret Hennig. For son Nicolaus, the Oley Valley Yoders identify the profile for his son Adam Joder. For son Jost, we have representation for his son Hans who married Katherine Ruesser, Christian who married Barbara Gerber, Caspar who married Verena Stauffer, and Jacob who married Margareth Stahli. The LDS “IGI” records have for years contained claims that YR1 and YR2 were sons of Christian Joder and Barbara Gerber…. our DNA testing rules this out! Also ruled out as a possible father of these folk is the Jacob who married Margareth Stahli. (Neither has the marker 19 value of “16”). Tests have come back with the “16” value from believed descendants of BOTH Jost’s sons Casper and Hans. More tests within these two families may bring some definite answers. 67 marker profiles are in process to look for unique patterns tied to specific lines. CONRAD YODER RESULTS SUPPORT ADAM YOTHER LINK: In YNL 11 (Apr. 1988) we provided our conclusions that the Yother families of Georgia were the descendants of Conrad Yoder’s youngest son Adam (born 1785). Results from a 25 marker test on a descendant of Adam Yother (through Con 85- John D. Yother b. 1818) have substantiated this belief by matching exactly the Conrad Yoder Y DNA profile!! JORDY/JODER LINK ESTABLISHED: There were many sons of the Nicolas and Jost Joder of Steffisburg, who seem to have left that town by 1700, and then "disappeared". This has made us wonder for many years if they could be among the “Jodres” in the Palatinate, some of whom became Yordy or Yorty (like the former Los Angeles Mayor) or Yotty in the US. Some of these folk settled in Anabaptist communities in Germany and Alsace. Yordy/Jorde immigrants came to the US as early as 1717, while others arriving as Mennonites in the middle 19th century. The first test from this surname was a descendant of Peter Yordy b. c1812 in France, who came to Illinois in the mid 19th Century. He shows a 23 out of 25 marker match to the Swiss Joder profile! This degree of match, means "there is a 99.9% likelihood you have a common ancestor" with the Swiss Joders! A descendant of an 18th century Yordy in Lancaster Co., Pa. is now in testing. OLEY RESULTS SHOW SOME UNIQUE PROFILES: Test results from descendants of immigrant Yost Yoder match the Steffisburg line, as does a sample from Hans Yoder’s grandson John who married to Sarah Shankle (OH11). Other samples have revealed different profiles entering the family. Three test results have been returned from descendants of John’s brother Samuel (OH13). Two of these are through his son George (OH132), and another through son Peter (OH133). The profiles match each other, but not ancient Swiss one. The indication is that Samuel himself (OH13) shared this profile, but was not the natural son of John Sr. (OH1). Another different profile is found for Isaac Yoder’s (OH1452) descendants, but we can not presently identify the generation in which it occurs. YETTER/YATER LINK: The Samuel Yetter (b. c1760) family of Columbia Co., Pa was confirmed NOT to link with the Yoders, BUT to share an ancestor with Henry Yater (b. c1765 VA) who settled in Kentucky by 1792. WHAT NEXT: More 67 marker profiles are in process. We are hoping to see unique markers which may allow us to tie an immigrant line to a particular Swiss branch. WHAT CAN YOU DO TO HELP? FUND SOME OF THE TESTS! We are still looking to collect a sample in some of the lines, for example: Con6, YR14, YR16, YR17, YR26. We also would like to do fuller sampling among the 19th century Alsatian and German Yoder immigrants and among the Joders/Jotters who remain in the Old World. We can’t say “Thanks” enough to all those who dug deep into their own pockets to fund their tests or to contribute to the tests of others. The YNL has also funded/subsidized over $1,000 worth of the testing to date. 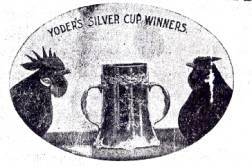 If you’d like to chip in to support future tests, such as ones to find the 67 marker profile for the Swiss Joder sons, you can do so by contributing on-line at: http://www.familytreedna.com/contribution.html or by mail to “The YODER PROJECT”. : Family Tree DNA, 1919 North Loop West, Suite 110 Houston, Texas 77008. You can see the full spreadsheet and narrative summary of the most recent results from the testing at the links available on the Yoder Homepage at: www.yodernewsletter.org . Stephen's siblings were John (1800-1867), Daniel #1 (1801-1810), Jacob (1802-1810), Elizabeth (1803-1885), Franney (1804-1874), Barbara (1805-1883), Susana (1806-1893), Christian (1809-1848), Magdelina (1810-? ), Leah (1811-1888), Sarah (1813-1849), Joseph (1814-1898), Daniel #2 (1816-1896), Rachael (1817-1899), and Moses (1818-1819). Initially living in Berks Co., PA, Yost and Sarah moved their family to Halfmoon Valley, Centre Co., PA about 1802 and, later, to Port Royal, Mifflin Co., PA.
Stephen met his first wife in a rather unique way. His brother Daniel (#2) traveled to Ohio about 1844 and, upon returning, described a certain Katie Miller whom he had met there. His words were so graphic that Stephen vowed to meet this young lady himself. After hiking over 300 miles, he found Katherine who was the daughter of Peter Miller and Barbara Plank. He soon won her heart and they married in January 1846. They lived, and Stephen worked, on a farm owned by Joseph Stibbs - now part of Wooster, OH. They had two sons, Jeremiah (1847-1861) and John M. (1849-1933), before Katie fell ill and died suddenly in July of 1850. Shoemaker and Susanna Blocher. Their family grew with the births of Rufus A. (1853-1927), Stephen S. (1855-1937), Samuel E. (1857-1940), and Mary Ann (1858-1903). 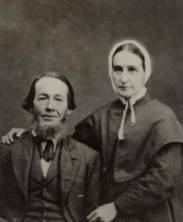 In 1848, he and his wife left the Amish church and joined the Church of the Brethren. In 1852, he was elected to the ministry. In 1859, the family joined the Westward Migration by foot, covered wagon, and buggy, traveling 600 miles to Washington Co., IA where Stephen had purchased 120 acres of prairie land with 20 acres broken for farming. While they lived there, Emma J. (1861-1937), Joseph P. (1863-1950), Sara F. (1866-1955), Margaret (1868-1962), Harriet (1870-1957), and William A. 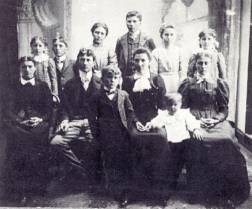 (1873-1953) were born into the family. 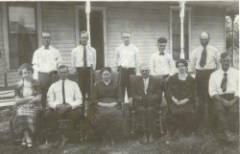 In 1863, Stephen helped found the first Brethren church in that county. Along with his farming, he preached in numerous churches in the area for many years and was instrumental in starting local elementary schools. with his daughter Margaret and her family until his death July 22, 1908. He is remembered as a proclaimer of Jesus Christ, an able preacher, an earnest educator, and a loving son, husband, brother, and father. ----YR2511g3924 Alan Dale Yoder (1960- ) & April Anne Faust (1958- ). Rufus A. and his first son, Paul R., followed in the footsteps of Stephen as active ministers in the Church of the Brethren. The last two entries in this list mark the end of this particular Yoder family line inasmuch as our sons were blessed only with daughters. FROM THE EDITORS Chris Yoder, Editor, Battle Creek, MI; John W. Yoder, Circulation Manager, Middlebury, IN; Rachel Kreider, Senior Contributing Editor, Goshen, IN; Esther E. Yoder, Mail Manager, Goshen, IN; Donald Kauffman, YNL Homepage Webmaster, Edmonton, Alberta, Canada. Other Contributors: Richard H. Yoder, Bechtelsville, PA; Hubert A. Yoder, Charlotte, NC; Dorothy Yoder Coffman, Malvern, PA; Dr. Don Yoder, Devon, PA; Neal D. Wilfong, Cleveland, NC. ORDER THE YODERS OF NC BOOK: The History of the Yoder Family in North Carolina by Dr. Fred Roy Yoder has been reprinted and is available once more!! Funds raised will be used to restore old Yoder gravestones and up-keep of cemeteries at Churches significant to the Yoder Family and the ancestors of the Author. Price $25 (postage included). Send checks to : "Yoder Memorial Fund" at: Yoder Family in North Carolina, c/o: Bill Yoder, 2707 Zion Church Rd. Hickory, NC 28602 . “PILGRIMAGE OF FAITH”, the wonderful video which describes the Joder/Yoder history from Switzerland to America is now available on DVD as well as VHS video! Price for either is the same $25 post paid. Order from Virgil Yoder, 110 Northumberland Rd., Irwin, Pa. 15642. PERFECT to show at your next YODER REUNION! Dwight: Check the name on the card. I'm a Yoder. Dwight: Well, can I get the Yoder discount? Clerk: You're a Yoder. You know better than that. No discounts. reputation for being cheap. I'll attach a picture of the store. WIFE IDENTIFIED FOR LAFAYETTE YODER (Con325)- I have not written to the newsletter for a long time but I am a great granddaughter of Lafayette Yoder (of the Conrad Yoder line) and I received a death certificate for his daughter Emily Kitory Evelyn Yoder Pounds. I thought this might be worthy of putting in the newsletter and hopefully maybe someone will be able to help us with some information. So here is what I have: Mrs. Emily Kitory Evelyn (Yoder) Pounds born April 17, 1874 in Iron County, MO. She married Alexander (Alex) Pounds in Steelville (this information I think is already on the Yoder site). She was a housewife. Now here is where it gets interesting. Her father' name was Marquis Lafayette Yhoder (as spelled on death certificate) His town or city of birth was unknown but the state is listed as Pennsylvannia (sic) USA. Emily's mother was listed as Persylia Caroline Murry born in Bellview Iron County, MO. The informant on the certificate is listed as Mrs. Ellen Heath (Emily's sister Sarah Ellen). Emily died Feb 10, 1925 in Butler County, MO near Neelyville. She died of Lobar pneumonia with a contributing diagnosis of Influenza. She was buried in Simms Cemetery, Neelyville on Feb 12, 1925. WEST COAST YODERS NEED REPRESENTATION! My husband is the son of Irvin Purt Yoder who is the oldest of thirteen children of Everert Yoder (Con2961), born around 1880 in Indiana, who settled in Oklahoma. This large family migrated to Calif. in the late 30’s where there are now many Yoders. It seems everything in the newsletter is centered in the middle and eastern part of the US. I’d like to see more about Yoders in the west. My middle son James Irvin Yoder is the Mayor of Willow, Ca. located about 85 miles north of Sacramento. He also holds the World Title and State Title in bench pressing for his age at 556 pounds. He has held this title for the past two years. The Jotter spelling is one found in the Eppstein area, but we do not know who this Andreas Jotter is. “From your Friend Emma L. Yoder, June 1, 1887, Washington, D.C.” This photo was found on eBay. 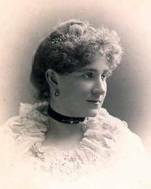 Emma Louise (Beery) Yoder (1856-1927) was the 2nd wife of Charles Theodore Yoder (OY42411). Maj. C. T. Yoder, was the highest ranking Yoder officer in the Civil War. He he did extensive Yoder family research in the late 19th Century, but his notes have never been found. He was featured in YNL18. Noah Yoder (YR23d3) Family Found? Information found by Carol M. Gilkison (Cmagicc@aol.com) has identified another member of the family of Melchior Yoder’s son J. Peter Yoder (M6). Peter was born in 1780 in Philadelphia County,and died in 1856. An obituary, written by her brother Calvin H. Yoder, reports that Mrs. A. E. (Elvira) Parsons , widow of Henry Parsons, was born in Juniata Co., Pa on Mar. 1, 1830 and died at her home in Willow Hills Twp, Jasper Co., Ill on Jun. 16, 1914. She was buried at the Miller Cemetery. Thanks to Phil Arden Yoder Jr of Thawville, IL for these circa 1921 photos of the family of Stewart L. Yoder (M661) (1859-1954) of St. Anne, Kankakee Co., Ill. Stewart was the son of Calvin H. Yoder whose sister is identified above. 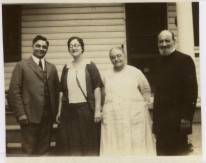 One of his descendants is among the current day Yoders who have participated in the Yoder DNA Project. Calvin was a son of Melchior Yoder son J. Peter Yoder (M6). Calvin moved to Green County, Ind. by 1863 and was in Jasper Co, Ill. by 1879. J. Peter died 15 April 1856 and is interred in the Emmanuel Lutheran Cemetery, Thompsontown, Juniata County, PA. Phil also provided the photos of J. Peter’s gravestone and of Stewart Yoder’s brother Harry (1861-1928) below. Against the wolf before the door It proved to be her charm. And thus she brought her groceries, And now and then a gown. And sent her girl to boarding school, Her boy to college too. And everything about her has A thrifty, well-kept look. DO ALL THE YODERS ON YOUR CHRISTMAS LIST GET THE YODER NEWSLETTER? The YNL will publish Yoder related inquiries or exchanges at no charge. Please limit as possible to include a full return address. All inquiries are checked against our records to see if we can help too. If you receive added info, please share it with the YNL for our files. Send Queries to: Chris Yoder, 551 S. Maple St., Saugatuck, MI 49453 or email at cyoder@tds.net . WHO WAS HANNAH YOTTER (1802 – 1897) wife of Michael Walborn (b. 1793 Frederickburg, Lebanon,Pa – died c1853 Lebanon Co, Pa) – If you can identify this lady and her family, please notify Chris Yoder at cyoder@tds.net or by mail at: 551 S. Maple St., Saugatuck, MI 49453. A recent translation of an old Bible shows its origins in the family of Samuel Yoder (YRC). Samuel Joder was a Bishop of the Amish Mennonite Church and lived in Waldeckerland, Sanfhof, and Ramersberg. It was from the village of Ramersberg that he wrote the February 19, 1806 letter to his "dear cousin" "Schweitzer Christian" (YR23) Yoder in America. It is interesting to see that when Samuel's children went to the US almost 20 years later, they first settled in Somerset County, Pa., where children of "Schweitzer Christian" still lived. In any event, this particular Bible came through Elizabeth Schlabach Yoder who was married to Moses H. Yoder (YR25149). Elizabeth was the granddaughter of John Schlabach (SBC in AAMG) who was born about 1774 in Europe and married Catherine Yoder (YRC4), daughter of Samuel Joder (YRC 1740-1806) and sister of Michel Yoder (1825 immigrant to the US). The Bible is small and was probably of the type that was used on a regular basis because of its size. There is a considerable amount of script in the front of the Bible on its first six pages. This script is now antiquated, having been phased out by the German government in the 1920’s. The script is difficult to read in places and the translations below are approximate. However, the Bible does seem to indicate various owners of the Bible during its early years. This Bible belongs to Jacob Yoder on the farm. This page is written to the son as a memorandum to him on December 22, 1787. Samuel Yoder’s son, Jacob (1769 – 1839) was the oldest of eight children (and the brother of Catherine) and died single in Germany. On page 2 of the Bible, it is signed "Johannes Schlabach. given to him by Jacob Joder 1817". In addition, the name "Christian Joder" appears but is crossed out followed by the notation "Raumersberg 1799". Jacob Yoder’s younger brother Christian (7th born of Samuel) appears to have died around this time as a youth of 14. Is this a notation that the Bible belonged to Christian at one point or just a notation of his passing? Whatever the answer, we do know that Jacob remained single and by 1817 was 48 and that he never left Germany. Lust und Liebe zum …. Who was this writer? 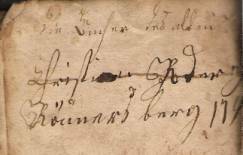 We don’t know but at least some of the writing appears under the name of Johannes Schlabach. A further clue comes from an even earlier Bible of 1598 that also came through the Samuel Yoder family that contains an almost identical verse. As detailed in the Yoder Newsletter from October 1989, that Bible states that it “belongs to John Schlabbach in Datzebrod and I bought it from Jacob Yoder in 1821.” Perhaps this was a common verse to write when a Bible passed from one owner to another. Dear God in Heaven, I wonder if you would answer my prayer. Talk to me from Heaven what thou wouldst have me to. Answer my prayer so that I might know what to do and tell the sick people. I thank you, God, that you have given me my health so that I can give health to the sick. I ask that my son live a consecrated and humble life. I ask that he be patient and thank God for His help. In humbleness, I thank you, God, for giving me this son, a dear child. Teach my son to take this to heart as these are the last words I am writing to him as a father. May he accept Christ and find rest in his soul as I have. Thank you again, God, that you have put my heart to rest and given me peace. But there is yet a lot to do to improve my religious life. Again, it is not clear which father and son are the subject of the above prayer. The Bible also contains a handwritten list of the Books of the Bible and other script which is difficult to make out because it is written in pencil. From the port of New York, the Bible traveled to Somerset County, Pa., Holmes County, Ohio, LaGrange County, Indiana, McPherson County, Kansas, West Plains Mo. and Alfalfa County, Oklahoma, all in the space of one generation and undoubtedly by wagon. The Bible is currently in the possession of Marshall Yoder of Harrisonburg, Va., the great-great-great-great grandson of Samuel Yoder and great-great grandson Johannes Schlabach Jr. The above translations were painstakingly done by Gunter Knops of Frankfurt, Germany and some of the above information was provided by representatives of the Kaufmann Museum in Newton, Kansas. The bi-annual Abe Yoder (YR257182) reunion will be held June 8-10, 2007 at the Roxbury Campground in Roxbury, Pa. An Abe Yoder Family cookbook is in the works. For any questions about this reunion, contact Rachel Shetterly, 778 State St Millersburg, Pa. 17061 Email is padutchgirl70@yahoo.com. Her phone is 717-692-0390. --- Harriet V. Yoder, 82, died May 15, 2006 at in her residence in Colebrookdale Township, Berks Co., Pa. Beloved wife of Yoder historian Richard H. Yoder. --- Mabel D. Yoder, 101 (Aug. 5, 1904 - March 3, 2006) of Albany, formerly of Sheridan, Or. Died Friday at the Mennonite Home in Albany. She was born in Columbiana, Ohio, the daughter of Daniel D. (YR1253525) and Drusilla (Miller) Yoder. (See the story in the YNL44 of her 100th birthday party and her visit to Disneyland which brought her the title "The Mennonite Mouseketter"). --- Martha Naomi Maust Yoder, 102 years, 7 months, and 15 days, of Grantsville, died Wednesday, March 29, 2006, at Meyersdale Hospital, Meyersdale, Pa. She was the widow of Alvin H. Yoder, who died Nov. 27, 1993. She leaves 6 sons, 3 daughters, 37 grandchildren; 71 great-grandchildren; and 15 great-great-grandchildren. ---Fannie M. Yoder, 99, (YR253c218) of Lititz Pike, Pa. Daughter of Christ B. and Fannie (Kauffman) Yoder and w. of Jacob C. Yoder. ---David S. Yoder, 85, died in Lancaster, May 7, 2006. Was son of Abraham and Laura Yoder. ---Charles D, Yothers, 76, of Bedford, Pa. died Jan. 13, 2006 (YB21494211). He was the son of Ronald Baker and Catherine (Thomas) Yothers and was a long-time subscriber to the YNL. ---Dorthy Pauline Yoder, 93, died Apr. 3, 2006 at Irvins, Utah. Widow of Fred L. Yoder whose photos were featured in YNL44. On Saturday, July 15 the 11th annual Oley Yoder Reunion was held at the Fire House in Oley, PA. There were 33 in attendance most from the local area, however Barry Yoder traveled the greatest distance as he joined us from New York. Nancy Yoder greeted the family at the sign-in table with our guest book and a get-well card for committee member, Edna Dierolf, who was recuperating from a fall. Some of the attendees brought pictures, including a computer slide show, maps and information about their branch of the Yoder clan. The genealogy table, manned by Bob Keller was very busy, and information about the family DNA project was available to show the progress to date. Helen Newell had raffle tickets and Yoder memorabilia for sale. Molly Yoder devised table decorations to go along with our theme of Pennsylvania Canals, which included canals with cargo-laden boats, mules, and guest favors along the “towpath”. Our president, Joe Yoder, started the formal part of the day with announcements. He gave prizes to the oldest female, Grace Yoder, an amazing 88, and male, Col. Harry Yoder at 90! He also recognized the youngest attendees Amy Balderrama, 16 and Armando Rodriguez, 17. Joe then introduced Jim Newell to say grace. There was a buffet luncheon with desserts made by committee members. Lunch was followed by a talk on the Pennsylvania Canal System by expert, Glen Wenrich, vice president and director of the Pennsylvania Canal Society and volunteer guide at the Berks County Heritage Center. His narrative explained the vast extent of the canal system in the region and details as to the operation of that network. He helped us see the major role that canals played not only in the foundation of transportation in northeastern United States, but also how they fomented the explosive growth of commerce in that region. Using reconditioned slides from the early 1900’s, he also provided us with a rare glimpse of the canals and their place in Berks County, the people manning the locks, canal boats, and the repair crews. He invited all of us to visit the Canal Museum in Reading, Pa, which he declared (without boasting) to be the best one in the country. The day ended with make-your-own sundaes and the drawing of tickets for the prizes on the raffle table. Everyone seemed to enjoy the day and we look forward to seeing as many of you as possible next year. -- The Oley Yoder Heritage Association, Inc. This picture presents some of the children of Fulton County, Ohio “double Yoders” John R. Yoder (YA242) (5/18/1851 WO- d 2/3/1907 Archibold, Oh) and his wife Anna Yoder (YA62). John and Anna both came from separate Alsatian Yoder lines. John’s forebears were Christian Joder who m in 1816 to Barbara Schott at St. Jacob's Mennonite Ch., in Basel, Switzerland. Anna’s ancestor was Michael Yoder b 1825 in France and married in 1849 to Francis Roth. A Yoder reunion was held 7/15/06 at the Plymouth Church of Christ in Plymouth, Mi. 15 Yoder descendants attended from: Fl. ; Oh. ; and Mi.. Festivities began with dinner at the Roman Forum Restaurant and concluded Sunday evening. The video, “Pilgrimage of Faith, The Journey of an Anabaptist Family” was shown.